Standard Print includes a full color print on BOTH sides and consecutive numbering on ONE side. 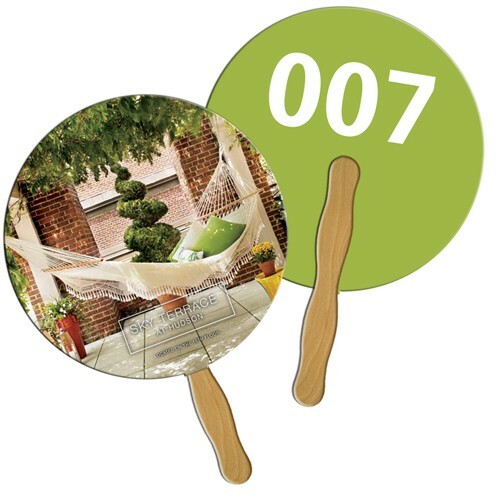 For numbering printed on both sides, please refer to our Auction Sandwich Paddles or Plastic Auction Paddles. Production for 1 day rush orders begins after artwork proof approval and payment have been received. To ship the following day, orders must be finalized prior to 9:30am PST. Printed on 22 pt. high density paper board with film lamination on both sides for extra durability. Wood handle is glued to the back of the fan. White plastic handles are available for an additional $0.08 per fan. Bidder paddles are a must have for any charity event. Your goal is, of course, to raise as much money as possible. The paddle raise is a great way to harness audience excitement at the event because donors can see who is giving and the bandwagon effect as well as their competitive nature encourages them to donate, usually at a higher amount. Plus, you will build long-term support by recognizing the people who are supporting you. You can't do this with mobile giving. Pricing and production times do not include shipping.